From the relating of a story as experienced by Denise Gadelha in the forest of Kassel, the exhibition questions through photography, video, paintings and sculpture, the limitations of language and its ability or inability to convey a specific message. The sensations, memories or concerns that bring the artist to produce a certain artwork are at the core of "O Que A Imagem Não Revela". This exhibition focuses on the viewer’s perception and the possibility for the artist to share his intention, through formal choices such as the light, the angle, the cropping, the textures and the colors. In this attempt, the impossibility of the memory is at the center of Marcelo Amorim’s video, Véu. A First Communion photo is decomposed through successive zooms until the image disappears, as if he’s trying to penetrate the surface of the image, in an effort to rescue the past and reveal the thoughts of the characters when the photographer’s finger hits the click button. By enlarging the image, the artist suggests that the experiment can only fail. Because, as one zooms in on the subject, it inevitably changes and gets blurred, as if the surface itself was losing its memory. In Denise Galdekha’s video Putukusi, landscapes that the artist eye couldn’t see, are revealed: caught in a rainstorm at Machu Picchu, where she captured, using the time lapse technique, what the rain was hiding from the human eye. In the second series of work, this time photographs, the artist tries to transmit the vibration emitted by a construction discovered in the Kassel forest, the stage of the Grimm brother’s tales. Superimposing two photographs separated by felt, the last hidden until the spectator lifts the separating layer; the artist question the possibility of translating the perception she had when she found a curious accumulation of branches creating a cabana hidden by an enigmatic tree. By sharing objectively the physical circumstances that led to the discovery of the construction, the artist brings forward the distension between the moment, its representation and the perception of the spectator, the main themes of her research. A similar experience guided André Passos along the paths in New York City Central Park, where he confronted with white sheets seemingly randomly scattered along the way. He reveals, by the repetition of physical uncontestable elements, the experience he felt, expressing of the randomness in a magical realism form. In Gordana Manic’s case, photographs from the Pretéritos series, tries to bring the public her experiences from the war and from being away from her country after fleeing from Serbia: phantasmagoric bodies, swirls and beams of light overlap dark landscapes, suggesting the difficulty to cope with the sensations brought on by the realities of living in a conflict zone and the distance that parts her from the places and the memories depicted. Marco Maria Zanin’s proposal reveals memories of the city, in a conversation with history in its widest sense. In the artwork Remonumento, small rubble pieces found in city dumpsters and covered with plasticine in a failed restoration attempt, are dialoguing with the photographs from the Lacuna e Equilíbrio serie. They translate the artist’s desire to rescue and find a new meaning to the past. In a different note, Nino Cais uses formalism to subvert the image itself, focusing on what its materiality cannot reveal. By grating parts of landscapes in the same way one does sculpture, he opens gaps, creating passages toward heterotopias. Outside the traditional frame, Nino Cais gives visibility to the image’s essence; opening the possibility for new perceptions. Finally, in the body of work Inscrições made of scratched stones collected out of a work field, Ivan Padovani composes a minimalist landscape in which he delivers his subtle point of view of the city. 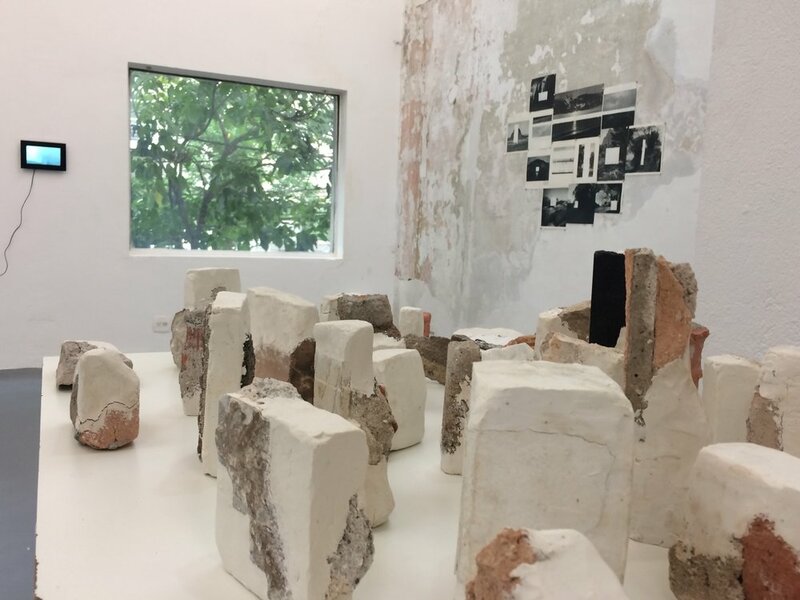 Creating a counterpoint to São Paulo’s frenzy and silencing its aggressiveness, he transforms its stigmas in a new language, reminiscent of a past of megaliths and cave paintings. Be it either conceptual or poetical propositions, objective or subjective, it might be impossible to define with certainty if the messages’ understanding is in tune with the intention of the artist. In the end, we’re left with questions, which are probably more interesting than answers. Marcelo Amorim (Goiania, 1977) graduated in social communication and editorial production from Universidade Anhembi Morumbi, Marcelo Amorim works mainly with painting and drawing. Using a collection of found and personal vintage photographs, he reveals through the repetition and the alteration of contexts, the dominant social narratives, in a critical lecture of the contemporary society. He was director of Ateliê 397 and is at the front of the studio and residency space Fonte in São Paulo. Marcelo Amorim’s work has been exhibited in Brasil, Mexico, USA and Europe. Nino Cais (Sâo Paulo, 1969) graduated in visual arts from Faculdade Santa Marcelina. Nino Cais is a multidisciplinary artist, working with video, photography, collage, drawing, sculpture and installation. He uses and reframes everyday objects or his own body. He participated in exhibitions in the USA, Argentina and Europe. Amongst the group shows, one can highlight his participation to the 30th São Paulo Biennial in 2012. His work also was featured in solo shows such as in Paço das Artes, Oficina Cultural Oswald de Andrade and Casa Triângulo. Denise Gadelha (Belém, 1980) is graduated in Visual Poetics from the UFRGS. As an artist, she works mainly with photography, with a specific focus in the gap that exists between reality and its representation, the artwork and its perception. She works ad educator and curator as well, promoting the circulation of photobooks. In 2017, she curated Photo-Paged at the Centre de la Photographie of Genève in Switzerland. She also conceived Livrotecagem + Escambo, performed at Vermelho gallery in the frame of SP-Arte/Foto. Also in 2017, she participated from the show Antilogias: o fotográfico na Pinacoteca, in São Paulo and of the project Marginalia Museum, in the Camera F space in Lugano, Switzerland. Her works has been shown in Latin America, the US and Europe. Ivan Padovani (São Paulo, 1978) graduated in administration and later photography by FAAP. He is one of the participating artists of SAO, independent space oriented toward visual art’s research and production. His work methodology is inspired by conceptual art. He addresses questions such as the transience and precariousness in large cities as representations of contemporary life. He has collaborated with the magazine Digital Photographer and showed in South America and Europe. André Passos (São Paulo, 1967) graduated from Sir John Cass Faculty of Fine Arts and Design in London, lived in New York where he worked as fashion photographer. Back to Brazil, he worked for the main national magazines before reorienting his practice towards contemporary art. Marco Maria Zanin (Padova, Italia 1983) studied literature and philosophy before moving to international relations and, eventually psychology. Concerned by the specific language of contemporary art and memory in its collective dimension; Marco Maria Zanin developed an autodidact artistic practice, through photography and sculpture. He created, along with a curator, an urbanist and a philosopher; the Humus residency, in Veneto’s countryside; bringing together the rural world from the contemporary art world, connecting disciplines and artistic practices. Showed in Europe and South America.